Our team is made up of 9 and 10-year-old girls from seven different schools across Balbriggan. We currently have 35 girls registered and actively taking part on a week to week basis. The team train twice a week, Monday and Wednesday at 7pm in O’Dwyers and play football and Camogie Go Games matches every Saturday at 2pm with one-week Football and one-week Camogie. The games are played on a home and away basis which gives the girls a chance travel across Dublin visiting different clubs and spending time with their friends while having fun and learning new skills. For the first time this year, the girls have started camogie to complement their football skills and to build upon the very successful “Gaelic for girls” programme we had the year before. The girls have learnt new skills and are really enjoying their time a hurl and helmet. We have even introduced the “circle of Doom” at the end of our camogie session where we get the parents and children to take part in a fun game. Our team is heavily family oriented with everyone playing a part; washing the jerseys, taking the subs, doing the toilet runs, helping out at the sessions and making videos at home with the girls to demonstrate the skills they have learned at the skill sessions each week. 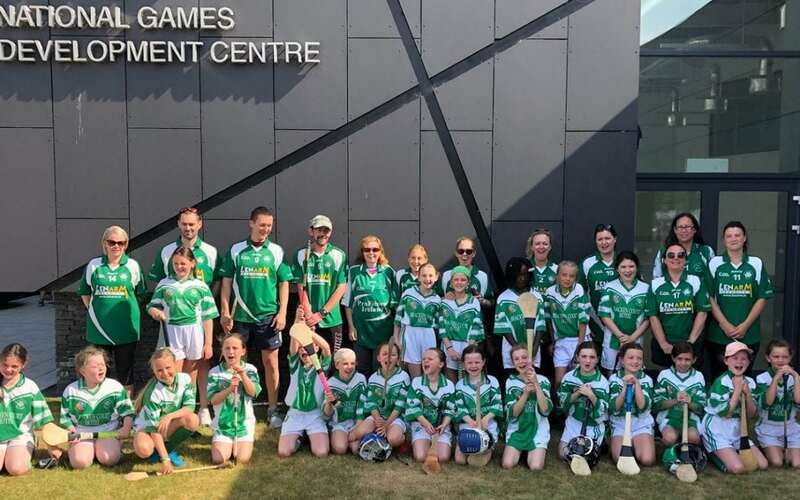 This year, the girls have been lucky enough to be selected for national Camogie programme called “hurl with me” this seen the girls and parents take part in a 4-week training programme to teach both parents and the girls the basic skills of camogie. This programme ended in a national blitz in Abbottstown, where the girls played teams from Galway, Tipp, and the North of Ireland. Another great day for bonding amongst the players and parents and for the girls to demonstrate their skills learnt over the year in a fabulous national facility. There’s even talk of a “Camogie for Mams team” been established. As part of our many activities outside of playing Football and Camogie; During the year as a team we travelled to Croke Park to see Monaghan beat Dublin in the National League Final. This brought a smile to our head coach Mick. In August, some of the team also travelled to DCU for meet and greet session with the Dublin Senior Camogie team ahead of there All Ireland Quarter Final and to Parnell park for another meet and greet with the Dublin Senior Men’s Football team. In additional, as part of our coaching and games plan the girls were lucky enough to receive a 2-hour skills session with Paudie Butler, a dual Tipp player in the 70s and national master coach, along with a visit and 2 hours’ workshop from Colm Nally on creating fun activities for training sessions. My daughter is looking to join a girls soccer team she is 10 years old is there any spots available or how would I go about getting her into a team. We run an u11 Gaelic football and Camogie team for girls (not soccer), we have over 30 girls on the team with the emphasis on fun and enjoyment through sport. We train twice a week and have usually matches at the weekend.